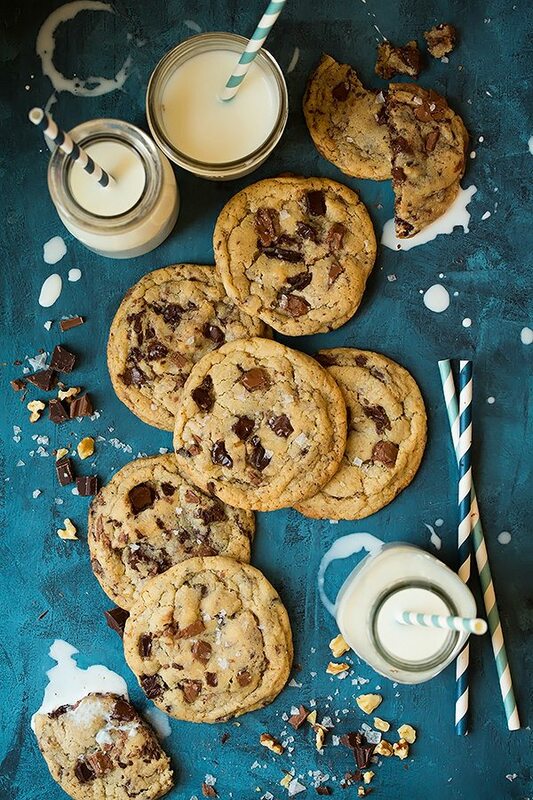 Chocolate Chunk Cookies are a perfectly delicious, totally irresistible cookie! These are soft and chewy, sweet and buttery and dotted with plenty of chocolate chunks in every bite. Finished with sea salt for a fancy flair and a nice balance to the sweetness. 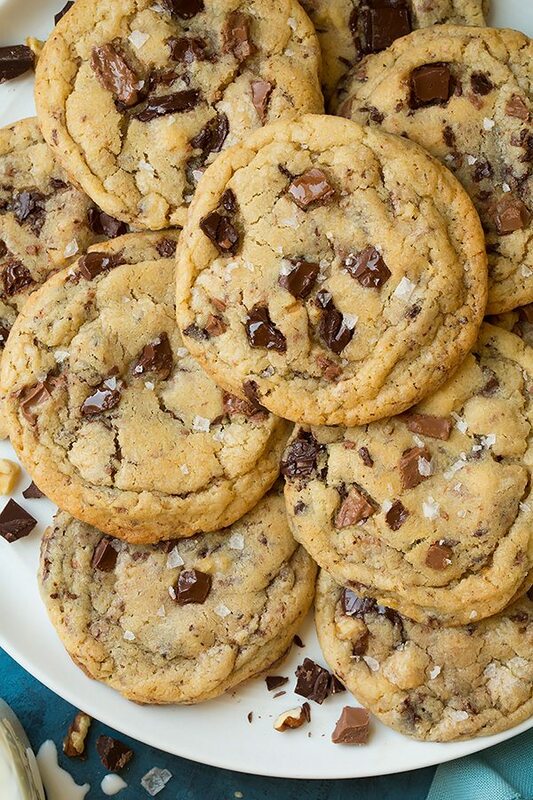 What better back-to-school recipe could there be than these homemade cookies? This time of year with the kids going back to school I try and make a few treats the kids can eat when they get home from school. 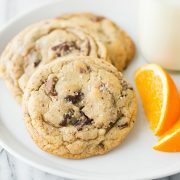 Of course one of their favorites are chocolate chip or chocolate chunk cookies and they absolutely love these! I love that they have the perfect texture with their crisp edges and soft and chewy interior, I also can’t resist those delicious chocolate bits and crisp nuts in every bite! And a little hint of flaked sea salt just takes these over the top. 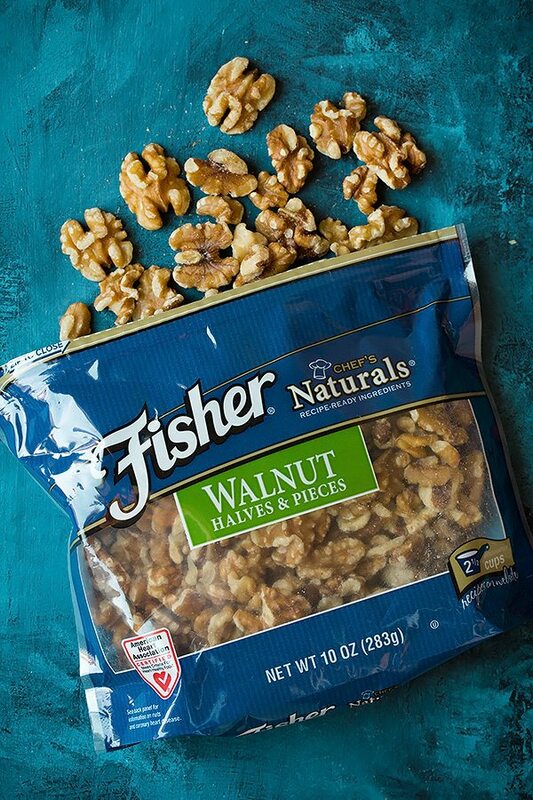 I made these with Fisher Walnuts because it’s a brand I love and I can trust. With Fisher Nuts I always get a product I can rely on both in flavor and quality. I never get a bad batch and they are the perfect addition to just about anything. I love that they are the perfect snack for my family. We went on vacation to Southern California this year and pretty much everywhere we went I packed a along a bag of fishers nuts we all kept snack in on. Then of course I keep all them stocked in my pantry and I snack on them between meals or toss them in with my oatmeal or yogurt and granola in the morning. I love that they are so versatile, you can add nuts to your main dish (like with this Almond Crusted Chicken, your side dish (like this Apple Pecan Salad) and of course any number of desserts (1, 2, 3, 4, 5). They are indeed an ingredient/snack to keep on hand at all times. 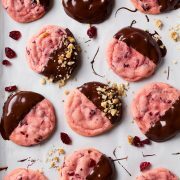 More Cookie Recipes You’ll Love! 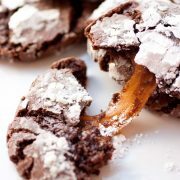 A perfectly delicious, totally irresistible cookie! 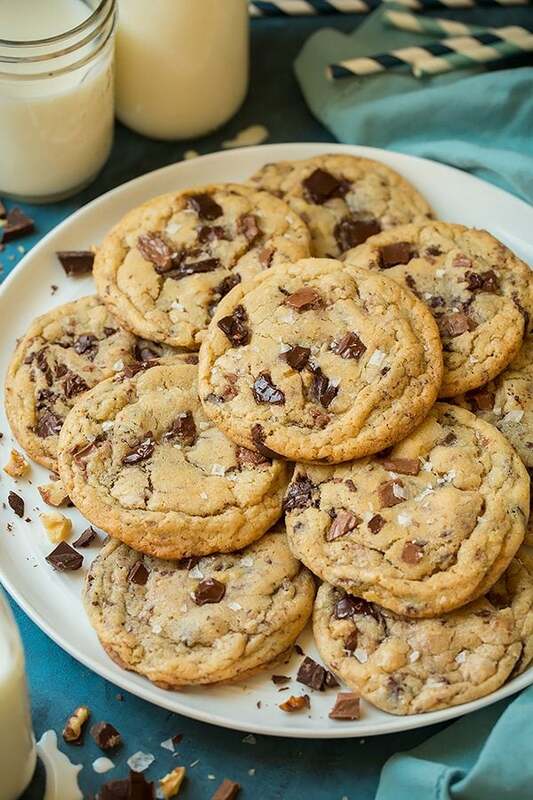 These are soft and chewy, sweet and buttery and dotted with plenty of chocolate chunks in every bite. Finished with sea salt for a fancy flair and a nice balance to the sweetness. In a mixing bowl, whisk together flour, baking powder, baking soda and salt for 30 seconds, set aside. In the bowl of an electric stand mixer, fitted with the paddle attachment, mix butter, brown sugar, and granulated sugar until creamy, about 1 - 2 minutes. Add in one egg and mix until combined, then add in second egg, and vanilla and mix until combined. With mixer set on low speed, slowly add in flour mixture and mix just until combined. Stir in chocolate chunks and walnuts. Shape dough into large balls, about 2 1/2 Tbsp each (45 grams each). Transfer balls to plates, cover with plastic wrap and chill 1 hour. Preheat oven to 350 degrees during last 15 minutes of chilling. Transfer chilled cookie dough balls to Silpat or parchment paper lined baking sheets and sprinkle tops lightly with sea salt if desired (keep any that aren't currently baking in refrigerator). Bake in preheated oven about 11 - 12 minutes (don't over-bake, the middles of the cookies should look under-baked). Allow to cool on baking sheet several minutes before transferring to a wire rack to cool. Store in an airtight container.